The FOSSA-556™ is a high performance multifunction muzzle device optimized for the fighting rifle. It suppresses muzzle flash and vents gasses away from the ground to limit dust disturbance. It also eliminates muzzle rise and reduces recoil getting the shooter back on target faster, all without increasing concussion or noise. It is imperative that a muzzle device on a fighting rifle reduce flash to the lowest possible level. Muzzle flash that is visible to the enemy will draw fire. The brighter the flash the greater the distance it will draw fire from. A compromise on muzzle flash brightness is a compromise on position disclosure. Unlike other multifunction devices, the FOSSA-556™ equals or exceeds the flash suppression effectiveness of the very best single function flash suppressors. The second priority is to improve the effectiveness of fire. Muzzle climb is countered by redirecting propellant gasses with an upward bias. Recoil is reduced by the exclusive tapered (narrowing) vents which force a large percentage of propellant gas to the sides much like a traditional recoil compensator. However, unlike traditional recoil compensators there is no additional concussion or volume. 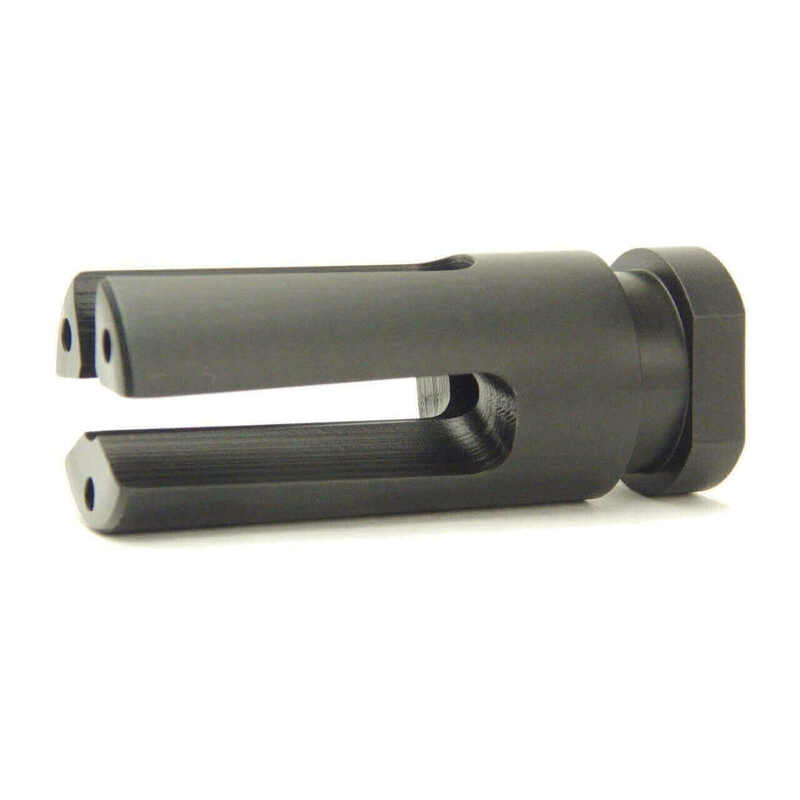 This version of the FOSSA-556™ is made from 17-4PH stainless steel and is available with either titanium aluminum nitride or black oxide surface coating. The titanium aluminum nitride finish provides a low friction surface to minimize adhesion of carbon and copper and withstands gas erosion extremely well. The black oxide is a tried and true MIL-DTL-13924 military grade finish. The current series (002) of this device maintains compatibility with GEMTECH HALO silencers currently deployed. Q: How should the FOSSA-556™ be oriented (‘clocked’) in relation to the barrel? A: The widest prong should be at 6 O’clock position. This means that the vent between the two narrow prongs will be straight up at the 12 O’clock position. Q: How does the FOSSA-556™ mitigate recoil without a traditional baffle? Q: How will the FOSSA-556™ affect accuracy? First, they have the potential to create propellant gas flows that disrupt the projectile. Propellant gas flows are very complex systems and it is not always obvious what will and will not affect accuracy. The FOSSA-556™ has been carefully designed and tested to ensure that it does not generate disruptive flows that negatively affect accuracy. It may be of note that most open prong designs do not have gas flow accuracy issues. The last area to talk about is the torque used to attach the muzzle device to the barrel. Excessive torque or a loose muzzle device can have a negative effect on accuracy. For a 5.56/.223 barrel the correct torque is generally between 10 -30 ft/lbs. Those more concerned with accuracy are best served toward the lower side. Those worried about muzzle device separation when removing a suppressor may be better served toward the higher side. A high temperature thread locker will provide additional assurance. Q: Will permanently attaching the FOSSA-556™ bring my 14.5” barrel up to 16” length? A: Maybe. The FOSSA-556™ has a fairly deep threaded socket; on some barrels it will only add 1.48” to the length of the barrel. Also, many 14.5” barrels are not exactly 14.5”, so it is important your gunsmith measures carefully and adds shims if needed. Q: Is the FOSSA-556™ intended for use with a sound suppressor? A: Current production models (002) are compatible with GEMTECH HALO mounting system. In the future, other versions may be made available to fit specific suppressors. Great flash hider...recommend by Mr. Gunngear. Well made, does as advertised. I had a little trouble clocking it on my PSA AR pistol without shims. I contacted customer service and they took care of me without question. I must say AT3 customer service people are awesome! And I love the delivery emails keeping posting on the status of my order. Quick delivery and works as advertised. Definitely recommend. Loved the flash suppression of the Vortex I was using but annoyed by the ringing. Read reviews of the Fossa and begrudgingly decided to spend the extra money and give it a try. Short story, it works exactly as advertised. Great flash suppression (appears to equal the Vortex), no dirt kick up in prone, subtle muzzle compensation and absolutely no ringing. Pricey but worth it to me. Am looking at building a SPR and if I do this will also sport a Fossa. Was very pleased by the ease of ordering along with rapid delivery from AT3!